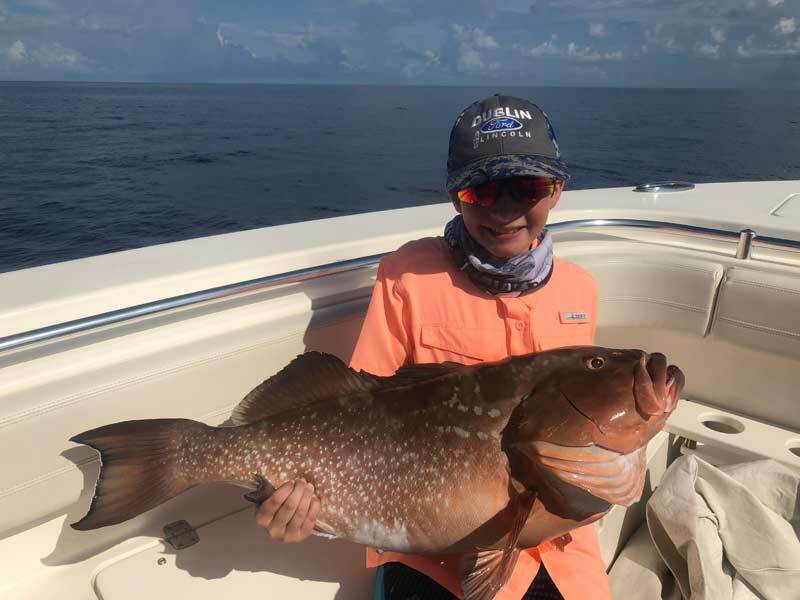 Gerald Jarzynka, 11, of Kathleen, Georgia, shows off a “beast” of a red grouper, caught while fishing with family on a charter trip with Capt. David White of Anna Maria Charters. 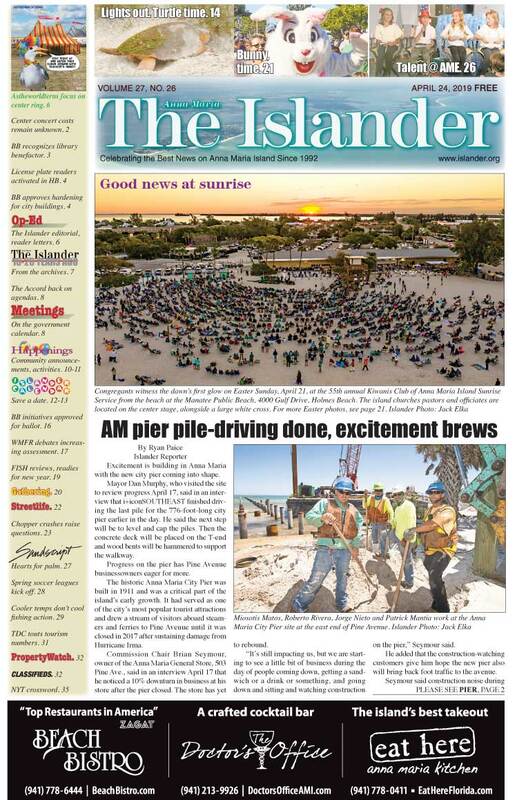 The fish was caught July 20 in 130 feet of water offshore of Anna Maria Island. White said a bonus for the family was a sea turtle rescue while boating in Anna Maria Sound. Fishing around Anna Maria Island is proving to be quite good as long as you’re willing to dodge frequent rain showers — and I mean frequent. Actually, the showers are brief, which can be nice. They also cool things down on the water. Just remember to watch for lightning. When you see it, it’s time to turn the other direction. Holding a fishing pole in your hand is just as bad as holding a lightning rod or a golf club. Not good if you plan on fishing again tomorrow. Inshore fishing is producing good action on spotted seatrout, Spanish mackerel, mangrove snapper and plenty of shark. For the trout and the macks, free-lining live shiners over deep grass flats is the ticket. As for the snapper, rocks and docks are where it’s at. If you’re looking to hook into something more substantial, the shark bite is fairly consistent. Fresh-cut chunks of Spanish mackerel will do the trick for a hookup. Expect to encounter blacktip, bull and hammerhead sharks. Moving offshore, reports of American red snapper remained steady in depths of 120-150 feet of water, however, July 20 was the final day to fish from private vessels for red snapper in the Gulf. The closure also applies to charter vessels after July 21. Red grouper, mangrove snapper, permit and cobia are taking the hook in varying depths and terrain. Finally, bonito and Spanish mackerel are present as well. On my Southernaire charters, I’m targeting a variety of inshore species. Around the passes, catch-and-release snook action is at its best for sport fishers. Free-lined live shiners are like candy to these fish. Most catches are 20-26 inches, although larger fish are in the mix. Mangrove snapper are being caught inshore — specifically around channel edges and docks — and now even on the flats. Near limits of these fish are attainable. And speaking of the flats, spotted seatrout, bluefish and Spanish mackerel are present on the deeper grass flats of Tampa Bay. Lastly, catch-and-release shark fishing is a great sport. Numerous blacktips, 4-6 feet long, are being caught. We’re also seeing an occasional bull or hammerhead on the hook. Capt. David White of Anna Maria Charters was spending his days offshore in 120-150 feet of water targeting American red snapper before the season closed. You can still target big red grouper and mangrove snapper and frozen sardines or live pinfish are working great as bait for both. Kudos to White for another sea turtle rescue this past week — a green sea turtle found bobbing in Anna Maria Sound. He’s got a direct link to Mote Marine Laboratory with his first rescue in 2016, a whopper loggerhead. Moving inshore, White is putting clients on spotted seatrout and Spanish mackerel on deeper grass flats. Blacktip sharks also are being caught inshore with some regularity. Fresh-cut chunks of Spanish mackerel will get you hooked up, according to White. Capt. Aaron Lowman is patrolling the nearshore reefs for a variety of species. Bottom fishing with live shiners is resulting in mangrove snapper and juvenile grouper. Free-lining shiners on the surface is producing good Spanish mackerel action. Casting jigs or live crabs is an option when schooling permit are spotted. Finally, while mackerel fishing, barracuda and goliath grouper are showing up as a bycatch. Moving inshore, Lowman is putting clients on spotted seatrout on deep grass flats. 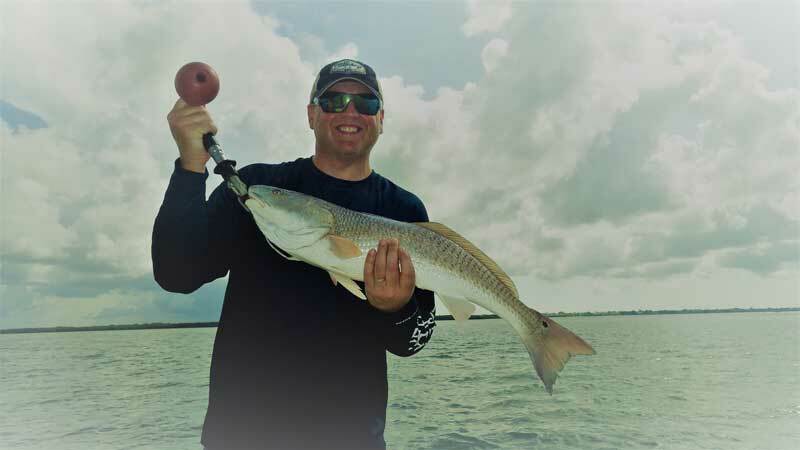 Fishing around residential docks is producing a bite for redfish and catch-and-release snook. Capt. Jason Stock is working offshore for cobia. Fishing around wrecks or reefs is yielding good-size cobia up to 30 pounds. Some are being caught while bottom fishing, while others are being sight-cast as they approach the boat to have a look around. While on the wrecks and reefs, Stock is catching permit, bonito, mackerel and goliath grouper. American red snapper were on the menu in waters of 100 feet or more. Martha Alvaredo at the Rod & Reel Pier is seeing mangrove snapper being reeled up with some frequency. Pier fishers casting live shrimp under the pier are being rewarded with these tasty little snappers. Most are averaging 10-14 inches. Using live shrimp as bait is yielding black drum, flounder and sheepshead. 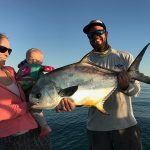 Those anglers using artificials — jigs or spoons — are being rewarded with Spanish mackerel, ladyfish and jack crevalle. Tipping jigs with pieces of fresh-cut shrimp can result in a pompano or two at the R&R.